The old saying goes that you should never judge a book by its cover but, let’s be honest, we often do. 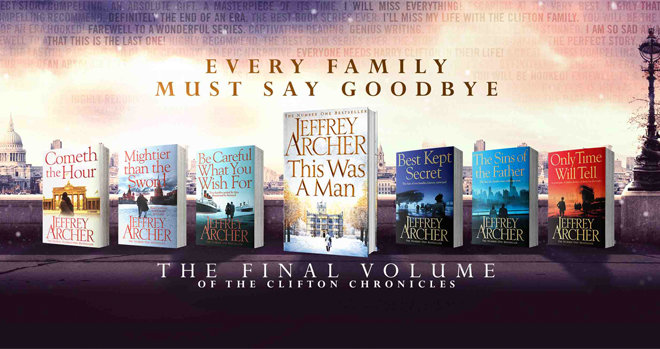 And when you’re publishing a series as magnificent as The Clifton Chronicles, you’re duty-bound to make sure the covers do justice to the stories inside them. To find out exactly what goes into the creation of a great cover, we spoke to James Annal, the designer behind the covers of the bestselling series as part of our behind-the-scenes coverage of This Was A Man. This Was A Man is the seventh instalment in a seven-part series, what factors do you have to take into account when designing covers for a series that you might not have to consider for a standalone? You obviously want them to visually work together as a series, so they sit well alongside each other in store, in promotions and at home. You also need to know what you're trying portray with the series in terms of an overall visual theme. In essence this series is a family saga, so the characters are important. I also needed to find a way of showing the passage of time and the journey these characters go on. What elements of the design have you tried to maintain to create a sense of continuity throughout the series? There are the basic elements – the placement of the author name, the simple colour schemes and the textured backgrounds. I've also continually aimed to use the titles as a major element, which has been a challenge as the series has gone on – some of the titles have been longer than others! With the imagery, I have always tried to show a sense of the historical period, relationships and travel. The more contemporary settings in the recent books have taken a little more imagination. How much does the specific plot for each book play a role? A lot. You certainly want to make sure the image is a good visual representation of the story inside. Having said that, everything is subjective and up for visual interpretation. For the jacket for This Was A Man, what was your starting point? The colour of the book was my starting point. With the series so driven by colours it felt important for the final book to have the right colour. In the end it seemed most fitting for it not to have one at all - to be white. White also works well for a book publishing in the winter. As it was a series about a family, about the passing of time and different generations, I also wanted the cover to show the family home – where it all started. I suppose after the characters have travelled and experienced so much of life it seemed to make sense to visually return home for the final book. Did you come up against any difficulties designing the seventh jacket for the series? Not especially. I had decided on the white aesthetic before I’d even started working on it, and I knew I wanted to show a grand family country house. Trying to find an image of a country house, which looked appropriate and was shot at the right angle was probably the hardest part. I wanted the house to look like it could have been built from bath stone and therefore suitable for the Bristol area where the house is situated. The process wasn't that long because I had clear sense of where I was going with it. There were a few options. One had an old, grand, historic ('family') car. Another had a couple walking down the drive instead of just the man. In the end everyone went for the single man. Often, simple is the most effective. Now all seven covers are complete, which would you say was your favourite to design? I think The Sins of the Father hardback jacket is probably my favourite. Overall, I’m really pleased with how they all turned out and I think they look impressive when they stand side by side.